It is unlikely that the global recession has completely dampened people's enthusiasm for new gadgets this Christmas. But for cash-strapped consumers with a shiny new mobile in their hands, there is a way of making money from their old, unwanted handsets. 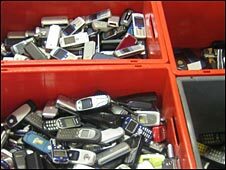 According to mobile phone trade-in website FoneBank, only 20% of UK consumers are recycling their mobiles but those that do can recycle their old mobiles for cash. A survey it conducted to find out what people did with their mobile found that 28% put them away in a drawer while 23% simply threw them away. "It's crazy that a lot of people out there are still just chucking their phones in the bin when they no longer have any use for them," said Mark Harrison, director of Fonebank. The need to recycle electronic devices such as phones, PDAs and digital music players is more than just a financial one as many contain materials that can be harmful to the environment. The main problem lies with the batteries used to power the phones, some of which contain toxic substances such as cadmium, which can contaminate the water table. Mobile phones now come under the WEEE directive, a piece of European legislation which aims to reduce the amount of electronic waste that ends up in landfill sites. It requires member nations to collect and recycle the equivalent of 4kg of e-waste for every person living in the country. Manufacturers, importers and retailers of electronic equipment are obliged to put systems in place that allow customers to recycle their obsolete devices free of charge although households are under no obligation. Fonebank recycled around 10,000 phones in November, the majority of which are earmarked for Africa, Pakistan, India and South East Asia. "It is a lot more difficult to buy a brand new phone in Africa and they are prohibitively expensive, so a good, second-hand phone is very attractive," said Ollie Tagg, director of Fonebank. During November Fonebank sent out £200,000 worth of cheques, with an average per person of £50, although an iPhone can raise much more. "One of the most popular ones traded in during October was Nokia's N95 which can raise £102 for the owner," said Mr Tagg. "People recycling their phones make a bit of money and feel they are doing the right thing. The whole process takes three minutes online and then they just have to stick their phone in a jiffy bag," he added. This year Fonebank has teamed up with Oxfam to donate a minimum of 10% of the value of the phone to aid the charity's work in the developing world. Other charities, including Age Concern and the British Red Cross, are also offering people the chance to donate phones. 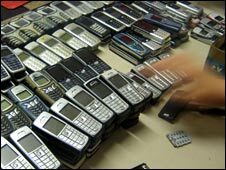 During December some six million handsets will have been exchanged. And for those who really can't be bothered to post off their old handset there are other ways of recycling them. "I have spent literally hundreds over the years on toys for my kids but the thing they've liked the most are old mobiles, particularly ones that flip and flash," one respondent to the FoneBank survey revealed.